There are many things that make my crafting life happy and one of those is being able to gift my handmade cards to friends. I am busy putting a set together as a Thank You for the hostess of a Dinner Party we went to last night, and I thought I would share some of these with you. 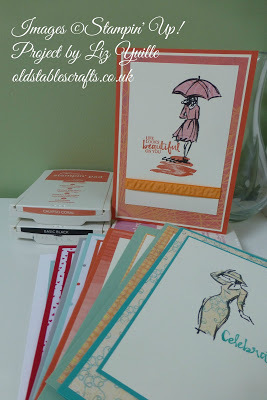 All of the cards are made using the Beautiful You stamp set. This set was launched in the current Spring/Summer Catalogue, and was one of the FREE items I got at OnStage in November last year. It is a fantastic set and needs two boxes! I was thrilled when I attended OnStage in April, to spot that it is carrying over to the new Annual Catalogue, so I have another twelve months to play with it. I hope you enjoy the cards I share with you in the video, and am sorry for my still slightly off voice. These are a great way to use up some of those retiring Designer Series Papers. I have included the codes any that are still available as I post this, but they may not be available by the time you see this post – sorry, you have to snap these things up quickly! (I can only see the UK lists, so am sorry if you are in a different geographic area, these may already have gone for you). Please note that the links bleow show the original, full, price for the papers, however the By The Shore is now only £8.00, and the two stacks are now only £6.30. Run to my online shop NOW! !